The mission of the Longmeadow Youth Football Association (LYFA) is to provide an organized football program that fosters the players’ appreciation of the game in a competitive team environment. Players developmental and physical abilities through a commitment to daily structured practices. The LYFA philosophy stresses physical fitness, fair play, and sportsmanship. 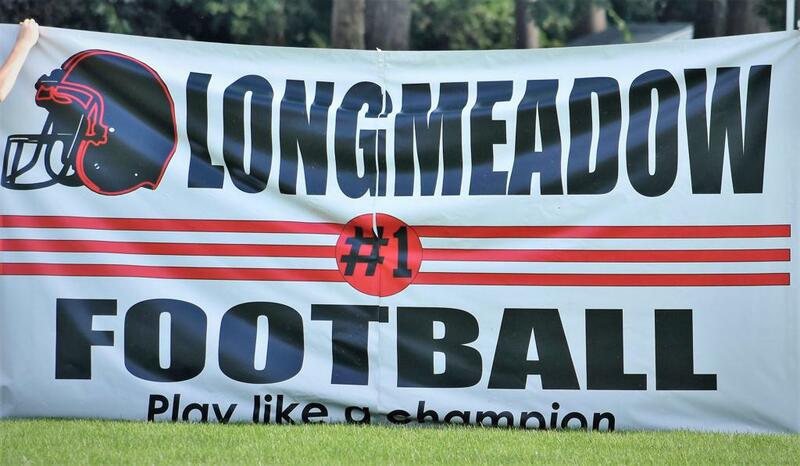 The Longmeadow Youth Football program is self-funded through program fees and fundraising events. Player fees cover the cost of equipment, league affiliation, and game day officials. Registration Fee hardship waivers may be discussed. Late registration fees are charged after June 12th. Late registration fees are not refunded at any time. The league is divided into PeeWee, Junior and Senior Divisions based on age and grade. Each Division has certain rule variations intended to promote safety and competition. The number of teams fielded will vary based on the number of players enrolled at each division. The chart below will help illustrate the basic differences among the levels of play. * Players who exceed this weight must play on the line from tackle to tackle. Game schedules will be available during August and posted as soon as possible. Games generally will be held on weekends, though some may be held mid-week during the evening depending on availability. The LYFA does not provide medical insurance coverage for players: all players must have their own primary medical insurance. Any medical costs and expenses will be the responsibility of the parent or guardian's medical coverage. One of the primary objectives of this program is to underscore the responsibility of being a member of a team. Attendance at practice is critical for the safety and well-being of each player and affects the morale of the team. Football is a highly organized, building block sport which requires thought, timing and coordination among 11 participants during each play. Missing practice may mean missing important fundamentals. It is our experience that players that miss too many practices, regardless of their skill levels are more easily confused in a game situation. This confusion sometimes distracts from the enjoyment of the game and perhaps jeopardizes the player’s safety. At no time will a coach play an individual who he/she thinks is not appropriately prepared to participate. Coaches take a great deal of time to organize practices. Each minute of practice is planned so that every player has a maximum amount of participation. A coach must know how many players will attend to plan the best drills, exercises, instruction, and scrimmage. It is inconsiderate to the coaches to neglect to tell them in advance about the limitations in a player’s practice schedule. When a player knows that he is going to be absent, he/she has the responsibility to notify their coach in advance. Players with unexcused absences can expect reduced playing time. Each player wears over $200 worth of team equipment every time they take the field. Each player must provide a colored mouthpiece (not clear or beige), a cup for male players, and appropriate footwear. Proper care of your equipment is important for both safety and to assure that your equipment is ready every time you play. It is your responsibility to periodically inspect all of your equipment before you put it on and tell your coach if it is not in perfect working order. Please inspect your helmet for missing or loose pieces and screws, and your shoulder pads for loose straps and clips. Players must wear a shirt over their shoulder pads. This is an integral part of their protection and keeps shoulder pads in place. Jerseys do not need to be fancy; an appropriately sized T-shirt will suffice. Game jerseys will be distributed before the first game and must be returned clean at equipment return night. Players not returning game jerseys or other equipment may be assessed a replacement fee. Game Uniforms, including pants, are NOT to be worn in practice unless you are specified to do so by a coach. Players should assume practice will be held regardless of the weather conditions unless a coach contacts them or posts a notice on a predetermined web site. It is the parents and players responsibility to ensure that players are dressed appropriately for weather conditions. Lightning – Longmeadow High School is equipped with a lightning detection system. If the LHS lightning alarm is sounded during practice coaches will immediately remove all players from the practice or game field. If the Williams School is open players will be moved to the gym area. If the school is not open coaches will do their best to move players into door alcoves for protection. Each team head coach will decide if the practice is over, or if the team will wait for lightning to pass. We will have a Parents Meeting prior to the season’s first game. The date of our Parents Meeting is listed on the schedule received during registration. Please arrange your schedule to attend this important meeting! This meeting provides for an open discussion on program philosophy etc. and we welcome your input. Please remember that coaches are unpaid volunteers. They are on the field with the sole desire to help teach your child the game of football. We insist that coaches become USAFootball certified to teach youth sports. Most coaches will devote an average of 15 hrs. per week for 12 weeks to help your kids. Some will spend 25 hrs, seven days a week each week on the football program. They deserve your respect and can always use some encouragement! Volunteering is the most sincere form of encouragement. Did you discuss the issue with your player first? Players often understand why coaches have taken a certain position, which may not be obvious to you.Try not to discuss your issue before practice, as this is generally a very busy time for the coach. After practice is preferable when players are off the field.We encourage you to call coaches at home to discuss your concern.Please avoid talking to coaches in front of other players.Before and after games is usually not a good time to express your thoughts, as emotions are generally high. A parents association exists to facilitate communication with parents and coaches, and organize volunteers. If you have tried speaking with a coach, or are uncomfortable doing so please contact the parent’s association leader. Coaches need to know what is happening with every player. Events in a young player’s life will often manifest themselves on the field. Problems at home or school can impact play and sometimes your child’s ability to effectively interact with his teammates and coaches. Often times we as coaches can help. Through the years we have worked with parents to assist in making sure that proper emphasis is placed on academics and that their child is fully aware that scholarly pursuits come before athletics. As an example, many times we have the ability to get their attention by leveraging playing time. Coaches care about your children! This is an education-based athletic program. It is not a win at all costs program. Our emphasis is on fun and personal development. We sincerely believe that youth football is a tremendous outlet for building self-esteem and learning valuable life skills. The precepts learned in this program can assist your child in being successful in whatever endeavors they choose.